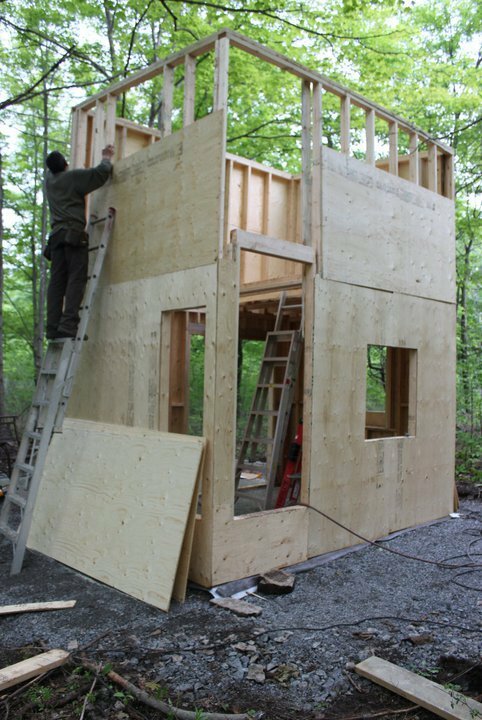 Due to the fact, that the building code in Ontario is followed in my area, I was restricted to build a place which is under 108 square feet (exterior measurement). It also cannot be over a 15.5 feet in height. Since 108 (exterior) is very small I realized that I could not go with straw bale as I had hoped. Thus I decided on a stick build with an additional 1/2 story loft which is under 6 feet tall so that it does not count as part of the square footage. Still the 1/2 loft would add the sleeping space which is required so that I would not be stuck pulling a bed out of a sofa every night. The second floor, meant of course, that I would lose a lot of the main floor square footage to stairs. Still, the 1/2 story option was sensible for my specific needs. You see, I have little dogs that insist on sleeping with me and dogs can’t climb ladders. Also, I recognized that I would have to carry them up because the stairs would have to be very small and narrow in order so that they did not fill the whole Tiny House. In putting the second floor up, I very nearly met my end falling off of a ladder. Nearly took Leo with me too. Very thankful that we got another day! If you have ever built, you may notice the plywood. I decided on plywood as opposed to particle board for sheathing both because I liked the idea of having better quality building materials as well as the fact that I am planning on using a local mill for the board and batten and I am not sure if this little mill will get the materials made this year before the snow flies. I felt that the small additional cost was worth it because of not being able to secure a solid date for the board and batten. In retrospect, I am glad I did because the mill was not able to fill the order this year. I, too, want to go with stairs in my house which is going to be 108 ft sq. I am thinking that going up a set of stairs is going to be a lot easier in 20 yrs (ok, so 5 yrs!) than trying to hoist my keister up a ladder. I think my dog might be able to do a ladder better than I can now!